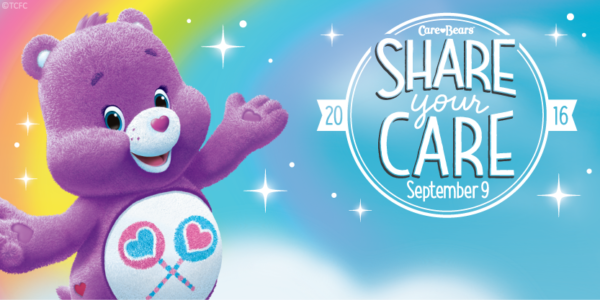 Earlier this Summer, while I was attending Blogger Bash in NYC, I attended the #ShareYourCare brunch hosted by the Care Bears. We learned a lot about the history of Care Bears (they're celebrating 35 years! ), how they support a message of philanthropy (currently by supporting Kid Ambassador Jessica Carscadden of We Care Bears Project @WeCareBears), and that Care Bears have partnered with Build-A-Bear. We also took the Care Bears #ShareYourCareOath. All I can say is Care Bears stand for caring, sharing, and compassion... and generally mean happiness. Seriously... you can't help but smile when you get to be this close to Sunshine Bear! We're asking you to take the oath too! For nearly 35 years, Care Bears have taught children of all ages about sharing their feelings and caring for others. The Care Bears toy line was originally introduced in 1983 to caring fans everywhere and they’ve never been out of the heart and minds of fans since. To enter... first you must comment on this post and let us know what act of kindness, big or small, are you planning for Share Your Care Day this Friday 9/9/16? Then sign into the rafflecopter form below to find other ways to gain entries. We can't wait to hear about all of the Share Your Care plans!